Every so often, a hockey game goes off the rails. On Monday night, it happened in Philadelphia. The Flyers were taking on the Washington Capitals in Game Three of their first round series and hopes were high. The game began with a ceremony honouring the late Ed Snider, with the Wells Fargo Center getting things off on the right foot. And the team certainly responded out of the box, with Michael Raffl getting on the scoreboard early and setting the Flyers up with a lead. Marcus Johansson tied it up and Washington took off, making hay out of an unimpressive Steve Mason and a flat-footed Philadelphia defence. Alex Ovechkin added another goal in the second period and things started to get ugly in a hurry. The Capitals piled up four goals in the third period, including another by Ovechkin, and the Flyers crumbled. It didn’t help matters that Philadelphia’s Pierre-Edouard Bellemare drilled Dmitry Orlov into the boards from behind, causing the Capital to fall headfirst. Bellemare was tagged with a major and a misconduct and Radko Gudas and Ryan White were also booked for their part in a subsequent scrum. And then, as though the hideousness on the ice wasn’t enough, some Flyers fans decided it would be a good idea to throw bracelets on the ice. The Philly faithful received the bracelets before the game as part of the pregame ceremony, the same ceremony designed to, you know, honour the memory of Ed Snider. Lou Nolan, the public address announcer, pleaded with fans to “show some class,” but it didn’t matter. 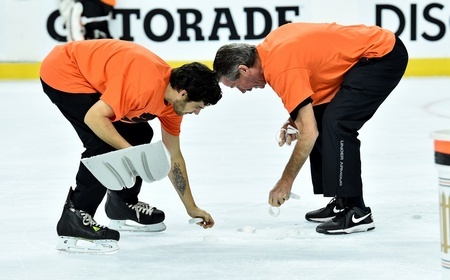 Eventually, the Flyers were assessed a delay of game penalty thanks to the antics of those in attendance. Now naturally, Philadelphia’s fanbase has every reason to be upset with the club. They barely mustered an effort on Monday night and they completely deconstructed themselves against the Capitals. Washington picked the bones clean and will likely walk out of this series with an easy victory unless something changes. But it’s hard to justify the kind of behaviour the fans decided to display in response, especially given the context of the night. At the very least, it should’ve made more than a few people think about tossing the bracelets designed to honour their recently deceased founder. Bad fan behaviour is something all sports have to contend with – and indeed all things in general. The sort of radicalism that comes with certain activities can have a mystifying effect: when things are bad, they’re horrendous and when things are good, they’re heavenly. But fandom has to be about more than just living vicariously through the actions of men on skates, doesn’t it? When Chris Falcone, Flyers fan extraordinaire, decided it would be a good idea to jump into the penalty box with Tie Domi, the enforcer’s fists settled the case and nearly everyone knew it was a bad idea. And when Vancouver fans took to the streaks and rioted in 2011, the disgrace was palpable. The city (and the franchise) has still not recovered. And there was the famed Richard Riot of 1955, where photos taken long before the age of “selfies” showed participants mugging for the camera. The passion of the fans is one thing, but what happened in Philadelphia on Monday night was another thing altogether. It was egotistical, obnoxious behaviour. And while the “product” on the ice may not have offered a lot by way of gratification, surely there are better ways to voice displeasure than tarnishing Snider’s memory.